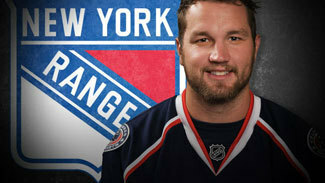 The New York Rangers picked up Rick Nash in a trade with the Columbus Blue Jackets on Monday in exchange for forwards Brandon Dubinsky and Artem Anisimov, defenseman Tim Erixon and a first-round pick, bringing an end to one of the longest-running dramas in recent NHL history. "I don't particularly like to talk about things that did or didn't happen," Rangers general manager Glen Sather said about the negotiations that started in February. "It took a long time, I'll tell you that much." "It's a really good deal," Rangers coach John Tortorella told Michael Kay on ESPN Radio. "We're losing a couple good players here and a prospect. I'm very close to Dubi and Artie. They've been very good players for us. Erixon is a young player who has potential. I still haven't seen it yet. But he has potential to be a really good player. But we're picking up a guy, and you have to give up something to get something, and I think we have a legitimate, really top power forward in the League coming our way with this deal." Once word leaked in February that Nash wanted out of Columbus, it seemed inevitable that he would land in New York. The Rangers had the right pieces, the need for offense and the salary-cap room to take on Nash's big contract, but a deal could not be struck before the trade deadline. The sides were close to a deal before the deadline, but one of the sticking points was believed to be Chris Kreider, whom the Rangers refused to include in any package for Nash. Kreider was with Boston College at the time but signed with the Rangers before the Stanley Cup Playoffs and was a major contributor during New York's run to the Eastern Conference Finals. Landing a bona fide offensive threat during the offseason was paramount for the Rangers, who finished in the middle of the pack in goals during the regular season before seeing the well go dry during the playoffs. The acquisition of Nash became even more important with they lost leading scorer Marian Gaborik until at least November and possibly December due to offseason surgery on a torn labrum in the sniper's shoulder. Both Gaborik and Nash are right wings. "We're always trying to improve the team; that's an ongoing struggle," Sather said. "The opportunity was here before the trade deadline, but we couldn't make it go. We felt that we always want to have a little more offense, especially with Gaborik being out until sometime in November. I think that once Gaborik gets together and Nash gets together, we've got some pretty good offensive players. This changes the complexion of our team. It's not going to change the way we play, but he's a world-class player. He was very excited to come to New York. We were one of his chosen few right from the beginning." Since his first year in the League as an 18-year-old in 2002-03, Nash has never scored fewer than 27 goals in a season. The 6-foot-4, 219-pound Nash, now 28, is coming off a 30-goal season and has averaged 33 goals per season since 2005-06. He has 289 goals in 674 games, all with the Blue Jackets. Along with his goal-scoring touch, Nash brings a hefty contract and very little playoff experience. He carries a $7.8 million cap hit over the next six seasons, the fifth-highest in the League. The Blue Jackets made the playoffs once in Nash's nine seasons; Nash had a goal and two assists in four games as Columbus was swept in the first round by the Detroit Red Wings in 2009. Nash was a member of Canada's gold-medal team at the 2010 Winter Olympics in Vancouver, posting two goals and three assists in seven games. The Rangers likely would've been one of the many teams to go after Devils forward Zach Parise this summer, but the unrestricted free agent who has five 30-goal seasons under his belt said he would not sign with them. Instead, he signed a 13-year deal with the Minnesota Wild. Anaheim Ducks forward Bobby Ryan, who has scored at least 31 goals in each of the past four seasons, also was a rumored target of the Rangers via trade. Hagelin worked very well with Richards last season, as did Gaborik and Kreider when playing with Stepan. The Rangers will have seven forwards worthy of six spots when everyone is healthy, which means Callahan could be a luxury on the third line. The Rangers have 12 forwards locked into contracts, but with Gaborik out to start the season, it gives a prospect a chance to make team. It could be J.T. Miller or Christian Thomas, both of whom have fared well in the Ontario Hockey League. The 19-year-old Miller had 25 goals and 62 points in 61 games for the Plymouth Whalers before joining the Connecticut Whale for the AHL playoffs last season. Thomas, 20, had 34 goals and 33 assists in 55 games for the Oshawa Generals and also joined the Whale for the postseason.